The first time I had navarin of lamb I didn't even know what it was. My favourite meat is lamb and when I saw it on the menu when my husband and I went out for a wedding anniversary meal I knew I had to try it. I realise not knowing what navarin of lamb was is probably akin to some of the contestants on Come Dine With Me thinking the 'vin' in Coq au Vin rhymes with 'bin' or being baffled by Boeuf Bourguignon. Back to dish and needless to say I loved it. As a stew dish it is perfectly suited to the slow cooker. I had some diced lamb neck but other cuts would work as well. I know the addition of the tomato ketchup isn't authentic to the recipe's French origins but it gives the necessary hit of tomato richness along with a hint of sweetness. Equipment: Larg frying pan, slotted spoon, Slow cooker/Crockpot. Sprig of fresh rosemary, 2 bay leaves and fresh parsley chopped. 2. In a large frying pan heat the olive oil and then brown the diced lamb. 3. Remove with a slotted spoon and transfer to the slow cooker. 4. In the remaining oil gently fry the carrot, onion and potatoes until they start to colour. 5. Stir in the flour to mop up any remaining oil and then pour in the stock. Bring to the boil and then transfer to the slow cooker. 6. Cook on HIGH for 4-6 hours or LOW for 7-9 hours. Serve on its own or with crusty bread. This sounds like the perfect warming dish for a cold spring day! I've never tried navarin either but now I know what it is, I will be using your recipe very soon. 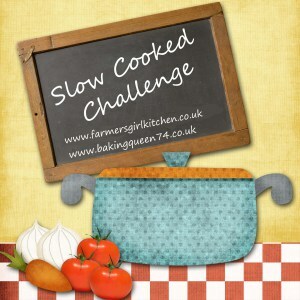 Thanks for joining in with the Slow Cooked Challenge!